FC Barcelona fans have painted Madrid in blaugrana after travelling by plane, train, bus or car, not just from Catalonia but from all over Spain, Europe and even the world to enjoy a day, or several days, of Copa del Rey Final fun. 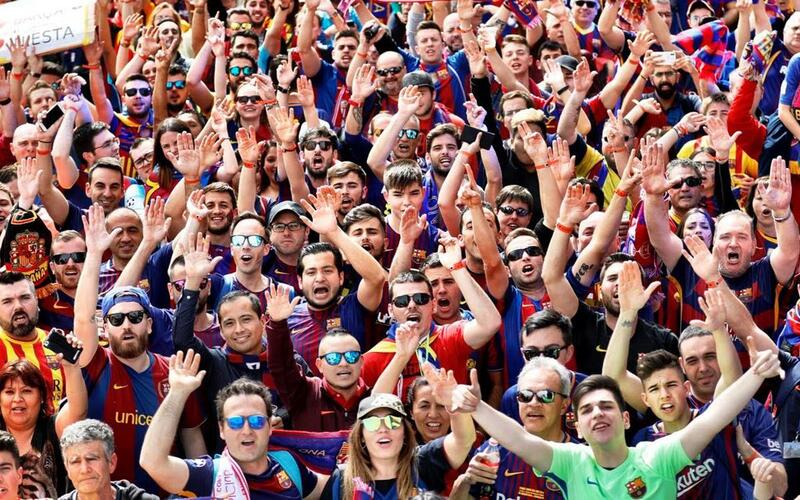 And one of the hotspots for all that Barça themed partying was the club’s Fan Zone in the vicinity of the Wanda Metropolitano stadium, where around 12,000 supporters gathered at some point of the day to enjoy the different activities. Along with the typical football fare of singing, dancing and the consumption of copious amounts of food and beverages, there were other old favourites like face painting, fussball, virtual footy and photo-ops, as well as a keepy-uppy contest for charity. The Barça TV team were there with a special stage on which a number of celebrity supporters made an appearance, along with live performances from music and magic acts with FCB connections and a number of fun contests, including a goal commentary competition and a hilarious dance-off between Yerry Mina impersonators. Representatives of the Barça Legends also gave interviews and mingled with the fans, including Albert Ferrer, Javier Saviola, Quique Estebaranz and Sánchez Jara. Various club directors, including Jordi Cardoner, Pau Vilanova and Òscar Grau also passed by the venue, which became the focal point for culès in the build-up to the 9.30pm CET kick-off against Sevilla. All in all, it has been a wonderful day for the 23,000 plus Barça fans that have made their way to the Spanish capital for the big occasion. Now it’s over to the players to see if they can top it all off by giving them all a fourth consecutive cup title to celebrate on their way home!